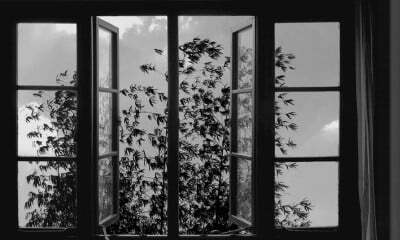 Movement and progress are the organizing principles throughout Abbas Kiarostami’s 24 Frames. Abbas Kiarostami’s final, posthumously released film, 24 Frames, is predicated on an absurd, almost comically Sisyphean paradox. Over the course of 24 single-shot vignettes, ordinary patterns of life are painstakingly reconstructed by the filmmaker and his team of VFX artists to the point that the end result resembles a passive, authorless recording—but, of course, not quite. Kiarostami became known for pulling this trick—that is, mingling artifice with reality in near-imperceptible ways—throughout his career, but he never saw the endeavor through to such a comprehensive extreme as he does here, where life forms, precipitation, shifting light patterns, and environmental soundscapes have been conceived and executed from the ground up and made to evolve within the frame seemingly of their own volition. The basis for the film, specified in an opening title card, is Kiarostami’s photography work. Looking over his stills archive, the filmmaker was apparently overcome with a desire to witness more than what his images could offer, and thus set about resurrecting, with some mixture of memory and projection, the “scenes” leading up to and succeeding the click of the shutter—an undertaking that deflates Henri Cartier-Bresson’s famous idea of “the decisive moment.” If one “decides” on immortalizing a single instant with photography, Kiarostami seems to posit, then one has robbed a moment of its life and complexity, qualities that can only be revived through cinema. It’s no accident that whenever a death occurs in 24 Frames, the vignette comes to an end; movement and progress are the organizing principles here. Those unfamiliar with Kiarostami’s photography won’t be surprised, given a general knowledge of his films, by the subject matter and compositional style of 24 Frames. What’s starkly different here is the emphasis on wintry settings, many of which are recaptured in a monochrome chiaroscuro that makes them seem especially cold and bleak. In the film’s Eadweard Muybridge-evoking second vignette, a black horse runs against the current of a snowstorm while the field of view, fixed from behind a car window, follows in lockstep, finally settling on an image of the horse meeting a companion to frolic joyfully in the blizzard. Despite Kiarostami’s trademark use of an obscuring car window that’s lowered at one point—here by an unseen passenger to allow for a clearer view of the landscape—you might mistake the shot for a transmission from the grim universe of Béla Tarr, so far removed is it from the warm sunshine and pleasant breezes that often weave through Kiarostami’s output. Unlike Tarr’s films, however, 24 Frames is far from a doggedly materialist work. From the film’s introductory vignette, a playful animated manipulation of Bruegel’s The Hunters in the Snow that inserts billowing chimney smoke and soaring crows to the original 1565 painting’s placid snapshot of winter, artifice is established as a technical principle. In blending photographic plates and visual effects components, the composite images very nearly achieve convincing photorealism, but certain elements, like the muscular movement of squirrels, deer, and cows, or the quasi-impressionistic renderings of snow mounds and fog drifts, uncannily disrupt the illusion. Kiarostami wields this omnipotence lightly, creating compositional harmony and intimations of narrative order one moment and cultivating spontaneity the next. Some of the film’s most indelible episodes follow rhyming patterns: In one, a quietly grazing deer darts for the shelter of a grove of trees when a gun fires off in the near distance, and in another a sudden thunderclap stirs a pair of lions from a mating session, with both scenes framed by makeshift proscenium arches (a canopy of trees in the first, a rock wall with a hole cut out in the second) to draw the eye to their respective animal subjects. Such organizing strategies, however, aren’t always offered. Sometimes there’s no notable narrative event to speak of, as in the extended studies of a few pigeons traipsing around a dead bush or a crow perched on a window frame seen from a shaded interior. Other times, Kiarostami, ever the master of the casually layered, multi-tiered composition, creates so many points of possible interest that it’s easy to linger on a development in one corner of the frame at the expense of another—a means of gentle overstimulation that works in one vignette to amplify the shock of a cat stealthily sneaking from the deep background of the shot to the foreground and pouncing on a bird. 24 Frames is a delight on these sensory levels alone, and depending on one’s patience for contemplating glimpses of natural and almost exclusively non-human goings-on, the overall effect is near-transcendent. But there’s also another feeling shading the experience, a steadily creeping poignancy that relates to the extra-textual knowledge of Kiarostami’s passing and the way in which the film’s ultra-simple structure—title cards announce each frame chronologically in between vignettes—acts as an expiring clock on the master’s career. If Kiarostami is, as suggested by Jean-Luc Godard, the end of cinema to D.W. Griffith’s beginning, then there’s a sobering poetry in the film’s use of the medium’s paradigmatic frame rate for its title and underlying construction. And especially gut-punching is the film’s concluding vignette, which bears witness to the last slow-motion stutters of an After Effects display rendering out an old movie’s soaring final kiss, all while the female editor dozes off at the workstation. That it’s unclear whether or not she’s manipulated the clip in some way provides the scene’s subtle tension, in addition to crystallizing the essence of Kiarostami’s art. Fittingly, “The End” arrives on her screen before we have a chance to determine the answer.